Does the new MPC upgrade allow ALL VST to be used with the MPC autonomous from a MACBOOK/PC or must it be hooked up? WHAT IS DIFFERENCE BETWEEN DIGITAK and OKTOTRAK? No. They launched 3 built in plugins which work in standalone mode. And they sound good. You have the AUtoSampler feature which you can use to auto sample external gear or VSTs. It's quite nice honestly. 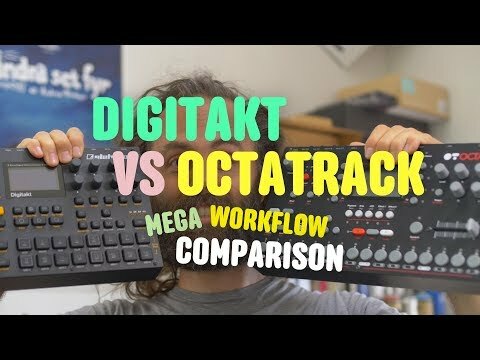 Digitakt is like a limited drum machine compared to Octatrack. Octatrack has more sample mangling features and time stretch. Either way, BOTH don't allow you to play a sample in CHORDS. Only mono chromatic mode. To summarize the video’s points (I can’t confirm myself, beyond having noticed that lots of experienced users seem to agree): octatrack has a steeper learning curve (which it is notorious for, but the workflow is super fast and flexible once you master it). Learning curve aside, Digitakt has its own merits for coming up with rhythm tracks specifically. Octatrack can cover that territory too, but where it goes much further is as a self-contained environment for full tracks (rather than rhythm tracks specifically): both for performing full tracks live, and for putting together full tracks in the studio. I think the Digitakt is so lovely, doesn't sound like but has that sp12/ 303 feel... If I was looking to get an sp-303/304 I would get a digitakt instead, there are just too many ways to mangle samples and too many ways to perform beats on a digi and it is extremely fun to use and sounds great. I will probably end up with an octa one of these days, but it won't be a replacement for the digitakt and the digitakt is a perfect companion for the mpc live being that they offer very different workflows that compliment and play off of each other well... you'll definitely be compelled to sample back and forth between the two, and it's a great way to lose some weight cause you'll forget all about eating. the mpc is not just a nostalgic brand name. these are some of the things it can do that no other beat machine can do. _explode tracks- takes a track and explodes all elements on that track to their own individual tracks. midi merge- take as many sequences as you want (up to the limit of course) and with a couple of clicks, merge them into one sequence... and you can do this all day long if you want over and over and over. I love this feature for working on a slew of tiny bits and then merging them all together. ...midi merge- take as many sequences as you want (up to the limit of course) and with a couple of clicks, merge them into one sequence... and you can do this all day long if you want over and over and over. I love this feature for working on a slew of tiny bits and then merging them all together. can't live without those features now, .... pad freeze?... C'mon. I didn't even mention that the mpc live actually has warping in the vein of Ableton. the time stretch can be applied to individual slices within a sample so you might have lets say 4 slices and you can time stretch the 3rd slice if you want to give it a new vibe, timing, rhythm etc.. within that said loop. Better pad triggers, decent size responsive touch screen, capacitive knobs, easier workflow, lots of storage options(sshd, sd, usb), around 600mg of sample ram, lots of effects and flexible routing, comes with about 1200.00 in software plugs etc, many sounds onboard out the box, autosampler, humanize, classic mpc emulation modes, multiple ways to do all functions, realtime pitch and time...although better when tethered, xy effects, 3 built in synths, its not a device for checking social media, pad performance mode (key, scale, chords, and progressions), stereo crossfade, the engine can do many tricks like psuedo granular, start point automation, arpeggiator with 4 modes, randomize, multiile formats in. Its a beast, even with the few things it lacks its the king of boxes at the moment! Paired with an ipad you can do most of what it lacks! @kobamoto One issue people bring up is how daw-like the sequencing workflow is on the mpc live, and how reliant on the touch screen it is. Do you find that to be the case? I’m bringing this up because a lot of the octatrack praise seems to come from how good a job it does at implementing a “hardware” (buttons, knobs, cross fader) focused workflow, and that completely breaks from the daw/ableton/maschine lineage - once users get past the steep learning curve - and that relies minimally on the screen. AFAIK this workflow is a big part of why octatrack also has the limited capabilities it has. Eg things like only having 8 (audio) + 8 (midi) tracks have a lot of workflow upside - to keep all options accessible within a minimal amount of switch pressing, and to allow navigation to rely on the screen as little as possible. Same with not even trying to enable the kind of polyphonic midi sequencing that is really best done with a piano roll editor..
no I don't feel that way at all, I've heard some people say that but it's weird to me because I'm familiar with all of the mpcs and the core workflow of the new models is still that same old tried, tested workflow.... there are some new things added of course but if anything I feel like there are not enough new workflows added like I want it to have parameter locks exactly how elektron does them and at least at this time akai is not going to go there............ but it's still got very good automation, and you can fake p.locks... I just like elektrons style better than everybody elses. like that midi merge, tempo/and time sig feature for example, even an mpc 500 can do that stuff. There are so many instruments out these days like the maschine, deluge, toraiz, many software apps and such that people have forgotten all of the things that groove boxes could do probably before they were born... the mpc is def a groove box workflow. Is it fair to say that what I was describing about octatrack’s workflow also breaks from that groovebox lineage, though? Been checking out what's available too and the Pioneer DJS 1000 is like a SP 404 on steroids and the Toraiz is more capable (song mode) like an Electribe on steroids. But neither are cheap. Oh well ... there is no perfect sampler machine yet. They all got different strengths and weaknesses. Fun doing the research but I'm not ready to pull the trigger on any yet.